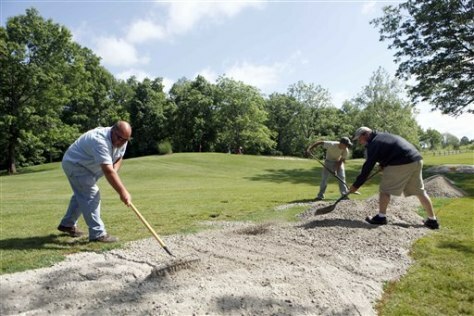 Groundkeepers Gordy Lowe, left, James Tonner, right, and Zach Woodrow at Deer Creek state park golf course in Mount Sterling, Ohio. They were hired for state-run courses despite limits on adding new staff. The state's six golf courses bring in nearly $2 million a year in greens fees and these workers are critical to maintaining that revenue stream, said Natural Resources spokeswoman Beth Ruth.